During the spring of 1983 Frank Pelisek, a long time A.S.H.R.A.E. 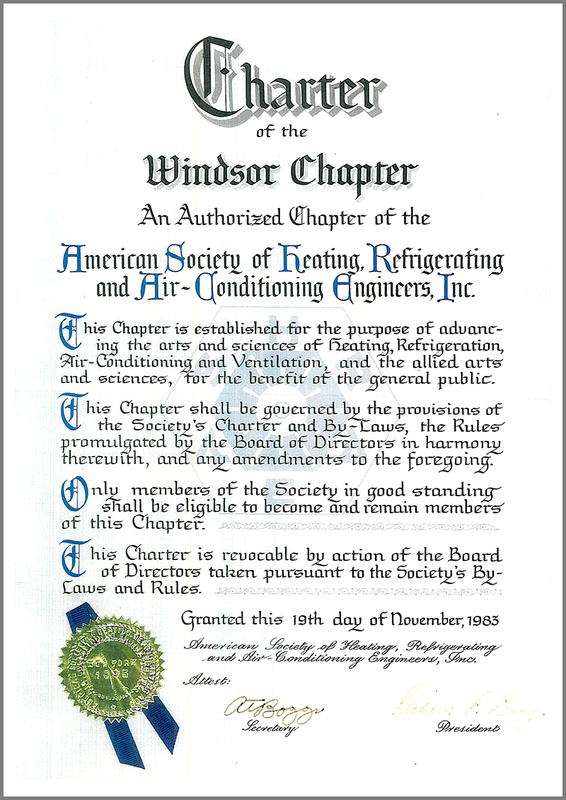 member and well known to the Windsor commercial and industrial community, through his many engineering, construction and sales contacts called a group of colleagues together to discuss the possible formation of a Windsor Chapter of A.S.H.R.A.E. During the past, London Ontario and Detroit Michigan shared the local National members’ attendance. A general poll by Frank indicated that there was about thirty members locally and this combined with the unusually large industrial and technical potential and student enrollment, convinced Frank that a viable Chapter could be formed despite the relatively limited local population compared to the base of other Chapters. Accordingly, during the first unofficial meeting in the summer of 1983, the interim Board of Governors comprising Frank Pelisek, Art Avian, Bill Colborne, Mark Benedet and Dan Castellan, under the guidance and technical assistance of John Kenney of the London Chapter was organized.